Rural Rhythm Records has announced the release of the single “Going Home” from Bluegrass Gospel band Crosspoint. Hailing from Southeast Kentucky / East Tennesse and formed in 2008 Crosspoint will make their album debut on Rural Rhythm Christian with the release of their album We’re Gonna Rise releasing on 13th May this year. Produced by Steve Gulley and recorded at the Curve Studio in Cumberland Gap Tennessee, We’re Gonna Rise is the real deal as it goes for authentic, inspirational and fresh bluegrass gospel music. The music and men of Crosspoint represent something vital to the well-being of so many of us – music with a message. I don’t believe it’s possible for anyone with a heart to listen to this music and not feel something both spiritually and emotionally. Great music from fine men who are truly dedicated to spreading the Gospel. It also helps that they’re some of the finest acoustic musicians, singers and songwriters around. I’m so honored and humbled to have been asked to produce the new project, “We’re Gonna Rise”, their first for the Rural Rhythm Christian label. Full of wonderful, heartfelt songs with a purpose, this collection of music is sure to move you – Steve Gulley – Singer/Songwriter/Producer. The album contains 12 powerful songs written by many top songwriters such as Kenny Hinson, Mark Wheeler, Kim Williams, Steve Gulley and 5 songs written by Crosspoint’s Gary Kidwell, Cleve May and Steve Partin. The band members’ faith played a major role in the creation of “We’re Gonna Rise”. In doing this new album, our creative goals were simple…make the very best project possible that would uplift Christ and bring a blessing to people. 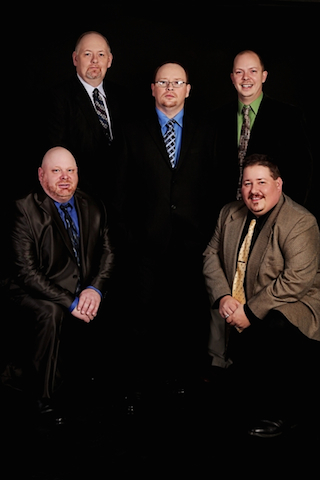 As a Bluegrass Gospel Band, that is first and foremost our mission, to spread the gospel message. From day one, it was our intent to select what we felt was the right songs to convey that message, whether from our own writings or from time honored spirit- filled songs – Gary Kidwell. The band’s first self-titled 2011 release, Crosspoint, had an almost unprecedented seven of ten songs receiving airplay on Les Butler’s Front Porch Fellowship radio program, and the group was also nominated for New Artist of the Year in 2012 by the Front Porch Fellowship Fan Awards. Now building on the success of their first album, We’re Gonna Rise will take Crosspoint to the next level and spread their music ministry to a larger audience. I’ve been a big fan and supporter of Crosspoint since day 1! We’re Gonna Rise continues their stellar string (no pun intended) of fine recordings for the Bluegrass and Bluegrass Gospel worlds to embrace! The Front Porch Fellowship network of radio affiliates will be proud to continue to spread the Gospel, Crosspoint-style – Les Butler, Host of Front Porch Fellowship / Singing News Magazine. The single “Going Home” is available now on AirPlay Direct for radio programmers and DJ’s.